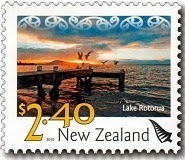 Virtual New Zealand Stamps: 2009 - 2010 Scenic Definitives. Back to 2007 Scenic Definitives. Forward to 2012 Scenic Definitives. 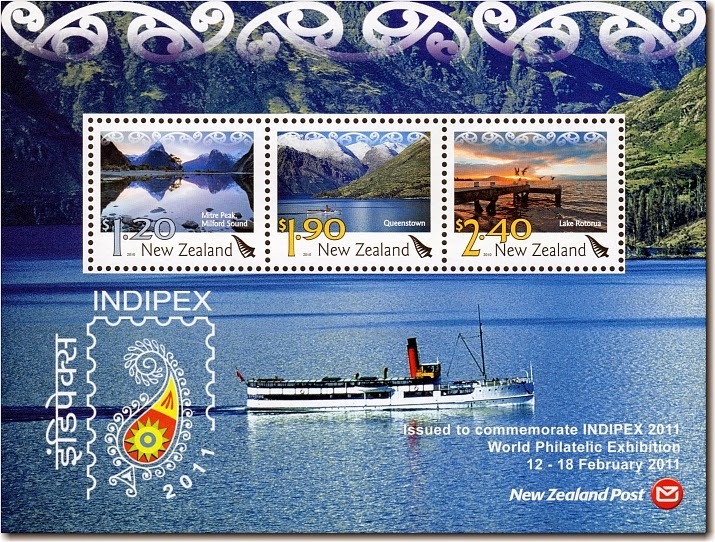 New Zealand Post continued with its Scenic Definitive Series with two issues in 2009 & 2010. Again the scenes were spread widely across New Zealand. While I like these stamps and have enjoyed featuring them in this series of posts I can't help wondering if this definitive series doesn't get mixed up with issues from the longer running scenic series that appears each year. 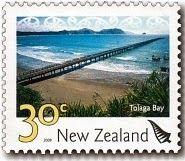 Located on the North Island’s east coast, Tolaga Bay is well known for its wharf – the longest in New Zealand, at 660 metres. The wharf was built in 1929 to accommodate large coastal trading vessels, but it fell into disuse as improved roads and motor vehicles offered more efficient transport. 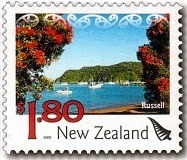 Now this is the classic holiday photo, boats in the bay framed by two Pohutukawa Trees in full bloom. 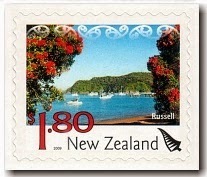 The historic township of Russell (once known as Kororareka) was New Zealand’s first permanent European settlement and sea port. It was also the country’s first capital, but today it’s a Bay of Islands holiday town, with an abundance of shops, restaurants and bars. 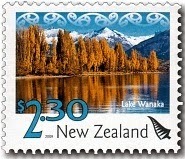 With an area of 192 square kilometres, Lake Wanaka is New Zealand’s fourth largest lake. This lake is famous for its autumn as can been seen in the view above. Its crystal-clear waters (thought to be more than 300 metres deep) are an aquatic playground for tourists, sailors, water-skiers and kayakers, while walking tracks, rivers and the surrounding Southern Alps provide outdoor adventure opportunities aplenty. 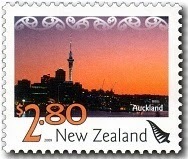 Auckland has the largest population in New Zealand, with about 1.3 million people. It’s a fusion of many cultures and offers a huge range of experiences and activities for visitors and locals alike. Popularly known as 'the City of Sails’, Auckland has more yachts and launches per capita than any other city in the world. This view is from the east with a western sunset in the background. Rising in the Southern Alps and travelling 150 kilometres to the Pacific Ocean, the Rakaia River is one of New Zealand’s largest braided rivers – and it’s crossed by New Zealand’s longest road and rail bridges. It’s a celebrated Chinook salmon fishery and known for its populations of wrybills, black-fronted terns and banded dotterels. Wellington is New Zealand’s capital city and the country’s political centre, it also supports a thriving arts and entertainment scene, with more cafés per capita than New York City. Other attractions include the Museum of New Zealand – Te Papa Tongarewa, the biennial New Zealand International Arts Festival, the World of WearableArt, the New Zealand Sevens weekend and numerous film festivals. 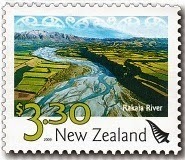 The $4.00 2009 Definitive replaces the existing definitive stamp that does not carry the New Zealand Post fern. One thing that defines a definitive stamp is the number of times it gets printed. With other stamps they have one printing and then will be on sale until either the stamps or the period of sale runs out. With definitive stamps, the time period is open ended with further printings being undertaken as required. This creates the situation that can been seen below where we have three different plate blocks from three different print runs. Now first off lets define what a plate block is. In the block of six stamps above we can see selvage around two edges which tells us this came from the bottom left corner of the sheet. On this particular sheet this was where information concerning the stamps and print runs are recorded. On the left side we have 4 NZ maps in the four different colours, black, cyan, magenta and yellow, used to create this design. Blow are details about the printer. Across the bottom we have designer and location. Finally under the third column we can see a little kiwi. This means that this block came from the first printing. Moving on to the second plate block we see the details on the selvage haven't changed all that much. The most important item to note is now the little kiwi now has a friend meaning this is the second printing. When we come to the third plate block we now find there are three kiwis meaning this is the third printing. What is of interest to me is the information concerning the designer under column one. If you scroll through the three plate blocks you will notice that it appears to change between printings. I can see no reason why this would need to be changed but someone has gone to the trouble of changing it twice. I would love to know why. 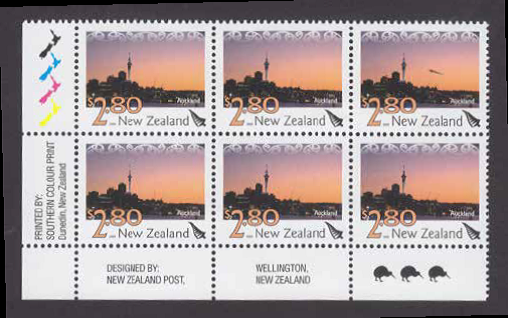 The 2010 Issues featured another five values, with two being also produced in self-adhesive format as well. 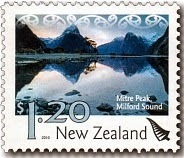 $1.20 – Mitre Peak, Milford Sound. 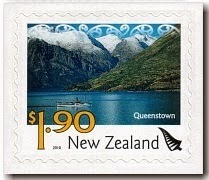 Available in gummed and self-adhesive formats, the $1.20 stamp features an iconic image of Mitre Peak, which rises almost 1700 metres above the waters of Milford Sound in the south-western South Island. The Maori name for Milford Sound is ‘Piopiotahi’ meaning ‘Place of the Singing Thrush’. The name ‘Mitre Peak’, probably given by a survey crew from the HMS Acheron in 1851, reflects its resemblance to a Christian bishop’s mitre or head-dress when viewed from the south. Surrounded by the magnificent Southern Alps and sitting on the shores of crystal-clear Lake Wakatipu, Queenstown has cemented its place as New Zealand’s premier lake and alpine resort. Its tourist activities include a cruise on the TSS Earnslaw - a 98-year-old vintage twin-screw steamer that’s the only remaining passenger-carrying, coal-fired steamship in the Southern Hemisphere. This stamp is available in gummed and self-adhesive formats. At 79.8 square kilometres, Lake Rotorua is the second largest lake in the North Island. Close to its centre is Mokoia Island, a rhyolite dome that rises 180 metres above the lake’s surface. Privately owned by Maori and managed in association with the Department of Conservation, the island is a sanctuary for some of New Zealand’s rare bird species, including the kokako, the kiwi and a breeding population of the endangered saddleback. The town of Kaikoura is nestled between the majestic Seaward Kaikoura mountains and the vast Pacific Ocean, on the rugged east coast of the South Island. Its strikingly beautiful location and proximity to the offshore Hikurangi Trench have seen it develop as a popular ‘eco-tourist’ location, offering an extensive range of marine-related activities such as whale watching and dolphin swimming. 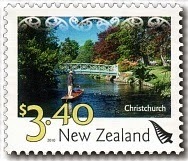 sold by NZ Post at the 2016 Christchurch Stamp and Postcard Expo. Christchurch (often called the ‘Garden City’) is the South Island’s largest city. As well as being a business hub, it offers a lively arts and entertainment scene and boutique shopping, as well as the gardens and wide open spaces for which it’s internationally famous. Many visitors enjoy a punt on the Avon River – named by John Deans in 1848 after the River Avon in Scotland. Indipex 2011, the World Philatelic Exhibition, brought the international stamp collecting community together to celebrate philately on a global scale. Showcasing some of the rarest stamp collections in the world, Indipex 2011 provided a unique meeting platform for collectors, dealers, designers, printers and postal administrations. I particularly like this miniature sheet. I think the blue of the lakes makes all the difference. 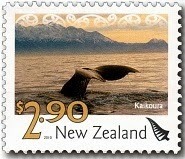 The Maori design at the top of both the stamps and the miniature sheet reminds me of Kowhaiwhai - Maori Rafter Paintings. The exhibition took place in New Delhi, India between 12 and 18 February 2011. New Delhi has a rich historical past, and today is a bustling, cosmopolitan city that has played host to a number of successful international events. Spread over an area of nearly 3000 square metres with participation from 70 countries, Indipex 2011 is attracted upwards of 100,000 visitors. 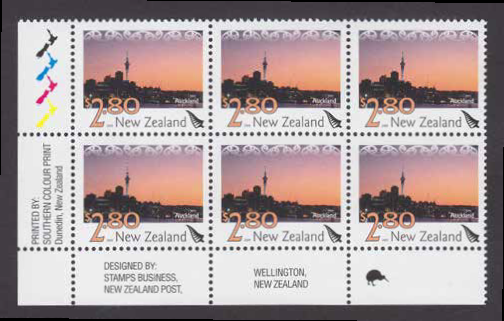 In honour of this substantial philatelic event, New Zealand Post is issuing a special miniature sheet and miniature sheet first day cover. 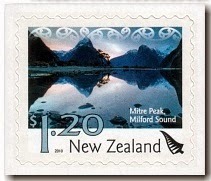 The miniature sheet incorporates three New Zealand Scenic Definitive stamps issued in 2010 – showcasing Mitre Peak in Milford Sound, Queenstown and Lake Rotorua. 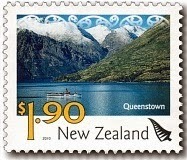 The stamps are set against a backdrop depicting the TSS Earnslaw plying the waters of Lake Wakatipu in New Zealand’s South Island. One self-adhesive and six gummed stamps. 30c, $1.80 (gummed and self-adhesive), $2.30, $2.80, $3.30, $4.00. 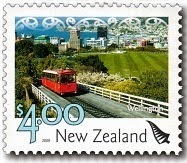 Stamps Business, New Zealand Post, Wellington. Southern Colour Print, New Zealand by offset lithography. Four process colours (self-adhesive tagged with red phosphor). Gummed: Tullis Russell 104gsm red phosphor gummed stamp paper; self-adhesive: Avery Dennison B100 PS1 Gloss Back Adhesive 210gsm. 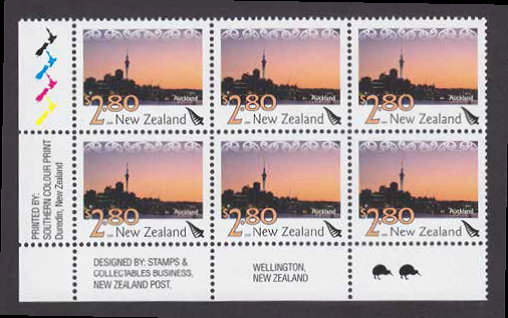 30c - 100 stamps, $1.80, $2.30, $2.80, $3.30, $4.00 - 50 stamps. Gummed: 13.33; self-adhesive: die cut. Unless stocks are exhausted earlier, these stamps will remain on sale until further notice. That was an interesting section on the three plate blocks. I enjoy the mix you have of technical specialist stuff and simple background information about the designs. What I found interesting was the fact they added a little kiwi for each reprint. Nice work and nice Blog. Pleased you like what we are doing here and we also welcome your feed-back comments too. When I started this blog, I was unsure where it would go. My original intention was to show some of my favourite issues but this has changed now. Its become a much bigger project. We have a team of five writers now, all working on different ideas. Some posts are intended to be more technical while others are more general in nature. Yes I rather like the kiwi idea too. Much better than using a number or letter.